Well, I've been meaning to read this book for a long time - I love Pratchett, but had only heared of Gaiman so I was eager to read it. Basically the plot revolves around the end of the world and the Antichrist. It's an excellent book and well worth a read. Received in the post today! Starting a mini-ray for this. Can't get into it at the moment and i felt it was unfair to keep the poor thing on my shelf any longer. Will send to Catriona as soon as i get her address. Sending off to Catriona. Enjoy it! Arrived safely this morning with a lovely Happy Crossing card. I do envy talented people. I will try not to hold onto the book too long as I do have a few ahead of it and I would like to get some of my own books read before the Unconvention. Confession time I have been sitting on this book (metaphorically) for a couple of weeks now, thinking I’ll find time to journal it once I’ve the address to send it on. I wasn’t sure what to expect in a collaboration from the authors who have brought us Sandman and The Discworld, but I knew it was going to be good. Neil Gaiman tempers Terry Pratchett well, keeping him in check where he would normally wander off into preposterous absurdity. Pratchett brings some frivolity to the darkness of Gaiman’s work. 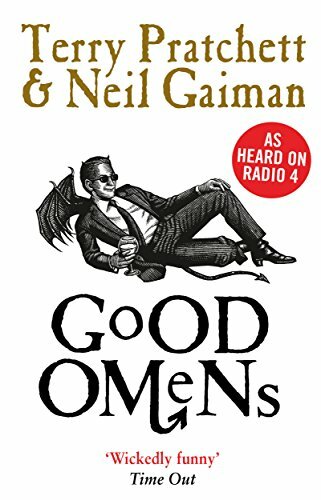 Pratchett keeps at least twelve story lines running, whilst Gaiman provides those story lines with some logical synchronicity. I would say that this book is an excellent starting place for anyone who is new to Terry Prachett’s work, or who have found his style difficult to get on with in the past. Browsing the dramatis personae I did grin like a deranged Cheshire Cat when I saw DEATH as Death and I will confess to pre-empting DEATH as the Discworld character. I was only slightly disappointed, but it is a worthy reminder that this is not a Discworld book. I would like to see these authors working together again. Finally I will get this book moving again. After many failed attempts to contact Hellie I contacted Reading-Fairy for advice as I know Hellie's address but didn't want to send the book just incase she is a bit overwhelmed at present (I know the feeling if she is). As Reading-Fairy has not replied I decided to send it on to Zurich so the book can continue it's journey and Hellie and Reading-Fairy will just have to shout at me. What with lots of rings, work, then being on holiday at home and the kids birthdays I've got a bit behind with my posting so this book will go in the post in the next few days. Don't worry, I wouldn't shout at you. I did reply and assumed you had got it but it looks like it is another message that has gone astray. Anyway, you have done just what i wanted as i didn't want to risk losing the book. REceived this in the post today - 2 bookrings ahead of it, but I'll get to it as soon as I can. Thanks to reading-fairy for organising the ring, and Catrionamoore for sending it! The ray turned into an even shorter ring and now is going back out again.